Bare Annealed copper as per IS 8130/BS:6360/IEC:60228. Very less toxic fumes emitted during fire. Quite Lesser Amount of Non-corrosive smoke emitted. FRLSH (Flame Retardant Low Smoke Halogen) grade PVC Compound Insulated. Bunching of copper in uniform lay & diameter. HPL FRLSH wires are Ideal for use in densely populated areas like Houses, Building, Flats, Apartments, Factories, Theaters, Hospitals, Education Institutions. 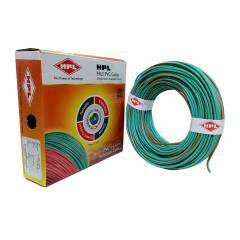 HPL 6 Sq mm Green Single Core FRLS Wire, Length: 200 m is a premium quality Low Tension Cables from HPL. Moglix is a well-known ecommerce platform for qualitative range of Low Tension Cables. All HPL 6 Sq mm Green Single Core FRLS Wire, Length: 200 m are manufactured by using quality assured material and advanced techniques, which make them up to the standard in this highly challenging field. The materials utilized to manufacture HPL 6 Sq mm Green Single Core FRLS Wire, Length: 200 m, are sourced from the most reliable and official Low Tension Cables vendors, chosen after performing detailed market surveys. Thus, HPL products are widely acknowledged in the market for their high quality. We are dedicatedly involved in providing an excellent quality array of HPL Low Tension Cables.